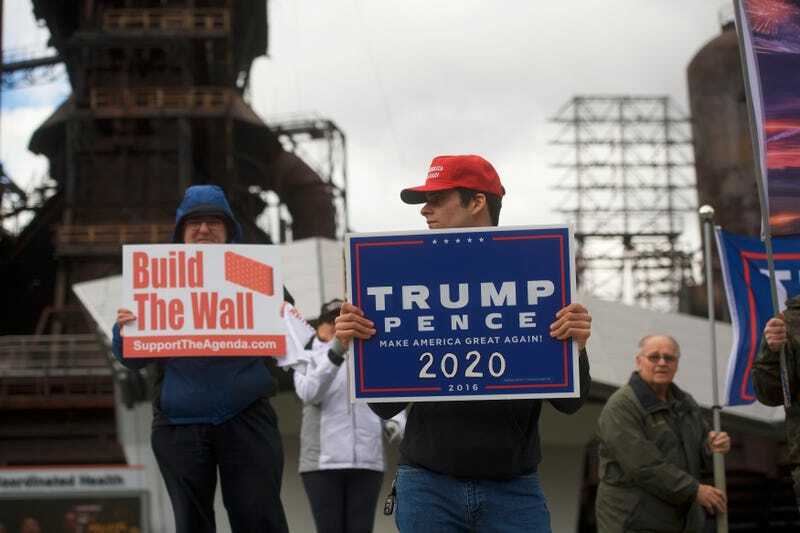 Ross Saveri, 22, joins fellow Donald Trump supporters demonstrating outside of a Fox News Town Hall with Democratic presidential candidate Sen. Bernie Sanders (I-VT) at SteelStacks on April 15, 2019 in Bethlehem, Pennsylvania. I have made an amazing discovery over the course of 2019 that has never occurred to me despite voting in elections for years. I am the most powerful person in the American electorate. Me, only me. Or at least I think so. I come to this conclusion after months and months on Twitter and other social media where I am consistently told that I will be responsible for Donald Trump getting re-elected in 2020. Now I’ll be fair, perhaps it isn’t me as Jason Johnson, it’s me as a black person. In particular, me as a black person who has the audacity to question Democratic candidates for 2020 instead of just fawning all over the flavor of the month. Apparently me, and other ungrateful black folk of my ilk, by merely questioning the policies of “electable” white liberal favorites like Sen. Bernie Sanders, Mayor Pete Buttigieg and, yes, even Sen. Kamala Harris are going to get Donald Trump re-elected in 2020. Who knew we were that powerful? Or maybe just maybe, America’s white Democrats are telling on themselves - again. The Democratic Party has a very funny relationship with African Americans. They can’t get elected mayor, governor, president, let alone dog catcher, without 90% black support and massive turnout. Yet rather than come up with specific policies that target black needs, they spend their time cajoling, chastising and, yes, implicitly threatening black voters to get in line with whatever the favored party candidate is. Democrats need black people like the Starks need those dragons on Game of Thrones. They tell themselves that they can win without us, but deep down they know they can’t, and resent being dependent on us and hate that now we have a seat at the table. So white Democrats lash out by calling critical black voters unruly and pre-emptively blame us for Trump’s re-election. Notice how Twitter came after MSNBC contributor and SIRIUS XM host Zerlina Maxwell for daring to talk about ‘electable’ Joe Biden’s roving hands and kisses? The nerve of black voters also asking about Sen. Harris’ threat to throw black mothers in jail over truant kids. You’re making it easier for Trump! How dare black voters question why Mayor Buttigieg has such a terrible record on minority hiring and promotion. We need Pete fresh and ready for his first debate against Trump! Why do you black folks like New York Times columnist Jamelle Bouie insist on looking into Joe Biden’s tough on ‘black crime’ policies and rhetoric before he was Obama’s vice president? Can’t you see he’s our only hope of beating Trump? White Democrats blaming black folks for electoral outcomes that they don’t like isn’t new. For a hot minute after the 2016 election, it was popular to blame black voters for Hillary Clinton’s loss to Trump. It took almost a year before many white Democrats would admit it was 53% of Clinton’s own ‘base’ of white women that pushed Trump over the top. During the 2016 primary, African Americans were blamed by white liberals for Sanders’ loss, which, by their logic, got Trump elected. Apparently black folks failed to realize that Bernie was the Forrest Gump of civil rights and had done everything from cradling MLK after he was shot to writing Jesse Jackson’s campaign speeches and producing the hook for Public Enemy’s Fight the Power. Even forever President Obama, always adept at mimicking white moderate rhetoric to black audiences, famously lectured the Congressional Black Caucus in 2011 to take off your bedroom slippers, stop complaining and get out to vote – as if the Democratic shellacking in the 2010 midterms were because Rainbow and Dre didn’t vote, as opposed to white backlash across the gerrymandered Midwest. In 2008, black voters were blamed by prominent white liberals, especially in the LGBTQA community, for the passage of Proposition 8, which banned gay marriage in California, even though the numbers didn’t back up those accusations. The difference this year is that white Democrats are blaming black voters before an election, placing the blame for four more years of Trump on African American shoulders before the first primary vote has been cast. Unfortunately for white liberals, that pre-and-post-blame game won’t work anymore. To paraphrase that wise and prescient political sage Silkk the Shocker, It Ain’t Our Fault. When #PrimaryPatty blames black people for Trump, there’s an implicit threat because she’s acknowledging that Trump poses a greater threat to black lives than to white people. Second, claiming black critiques of Democratic candidates will elect Trump is a tacit admission that white Democrats aren’t willing to do the work to bring all of their wayward MAGA-loving cousins from suburban Atlanta, and central Kansas, and Uptown Manhattan back to the right side of history. It means quietly at church and spin class and college alumni group texts that the 53% may be disgusted by Stormy Daniels and shed a tear over babies in cages, but will still pull the level for Trump come November 2020. Democrats are lashing out at black people because that’s easier than facing the ugly reality of the choices made by majority of their fellow white voters.